First impressions I arrived at Beirut international airport (a 15 minute drive from the city centre) at 0225 for my 0355 flight LO146 to Warsaw. I was flying between Beirut and London with LOT – for the connecting leg between Warsaw and London, click here. 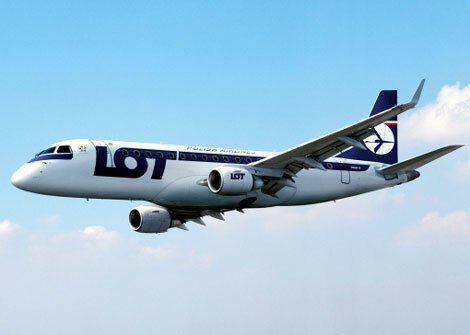 LOT launched this three-times weekly service between Beirut and Warsaw in June 2010, with Warsaw-bound flights on Tuesday, Thursday and Sunday. I had attempted to check in online for this flight, but LOT does not yet allow this for flights from Beirut, so I ended up just checking in for the Warsaw-London leg, so that I could choose a seat close to the front of the aircraft. When you arrive at the airport there is a choice of “Check-in West” or “Check-in East” – it wasn’t immediately obvious but I guessed that I should use the former as I would be travelling west towards Warsaw. Passengers have to pass through a preliminary passport check before entering the main departures area. While I was waiting in the queue I looked at the departures board and it said the LOT check-in counter was at C27, so once inside I looked for this desk, but there was no sign of it. I ended up asking a helpful Alitalia employee, who said that the LOT desk was at the other end of the departures area, which when I reached it was ironically by the entrance for “Departures East”. There was no queue at all for check in, and I received my boarding pass for the Beirut-Warsaw leg, advised that the pass for the Warsaw-London leg would be produced at Warsaw. I headed through a quiet security check (no request to remove my laptop or bag of liquids from my bag), through another passport check, and headed for gate 1, where we boarded at 0330, and were airbourne by 0405. The seat This Embraer 175 aircraft is configured 2-2 throughout, with two rows of business class at the front. The seat felt relatively new, and was 18 inches in width, with a pitch of 31 inches and a recline of eight degrees, and there are adjustable headrests. For a seatplan of this aircraft, click here. Where to sit? Not being able to check in online I had been unable to choose my seat in advance, but would have chosen a seat close to the front of the aircraft, in order to among the first off the plane to allow more time to find my connecting flight. As it was I was assigned seat 10B which was fine. There’s not a great deal to choose from on a small plane like this, so it’s down to a preference of window or aisle seat, and whether or not you want to be close to the toilets (the economy section runs from row 3-21). The flight The flight was almost completely full in economy, with just a couple of unoccupied seats dotted around the cabin. Soon after take off we were offered a cleansing wipe, followed by drinks, and then a meal consisting of cold meats (no pork, as advised by a card with a pig crossed through), as well as pickled mushrooms, lettuce, bread, butter and soft cheese, and a chocolate wafer biscuit. A crew member also came round offering rolls. The meal was identical to the outbound leg between Warsaw and Beirut (for the review click here), but at around 0430 in the morning I couldn’t stomach much in the way of food, so I had the chocolate bar and a cup of tea, and then managed to get a couple of hours sleep. Arrival We landed 30 minutes ahead of schedule at 0610, and transit passengers were advised to head for the transfer desk to obtain their boarding passes. We were then bussed a short ride to the airport terminal. For a review of the connecting flight between Warsaw and London, click here. Verdict A popular flight, with friendly staff, a punctual departure and early arrival.